From New moon to Full moon, this personalized monthly forecast and planner will keep you from going crazy. Moon Plans will prevent your best laid plans from going kaput. You'll know when to work on creating and what days are best for you to launch and promote. 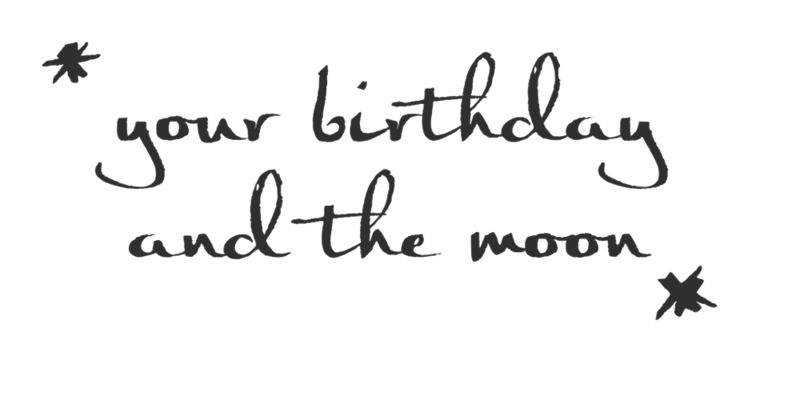 Moon Plans are 100% specific to YOU because they are created based on your birthday - not some generic, vague magazine BS. Unlike typical planners that rely on a traditional calendar, your Moon Plan is specifically calculated to when the moon returns to the same position it was in on the day you were born. ◎ Your month's style - how you look to others and how you feel when you look in the mirror. ◎ Your monthly moves - what you need to focus on, goal setting and getting things done. ◎ Your daily magic breakdown - what days (and even to the minutes) give you the best chance for success for promotions, writing, or reaching out to partners. Also, what opportunities or challenges that may come up. ◎ New moons & Full moons - how to harness their energies and get the most out of their magic. With Moon Plans you will literally have everything you need to plan your mystic life and biz at your fingertips. All you need to do to get your custom Moon Plan crafted by me is select how many months you would like to work on in advance and provide few details (like your full birthdate, time of birth, city & country of birth). I take care of the rest. Because these are highly-customized and personally crafted (it's about 35 pages per plan per month), you can expect to receive your Moon Plans between 3 - 5 business days (depending on how many months in advance you order). If you order the 3, 6, or 12 monthly Moon Plans, you will receive them all at once for powerful planning. Since this is a newly launched offer I'm offering special new moon pricing for those who are interested now in planning.